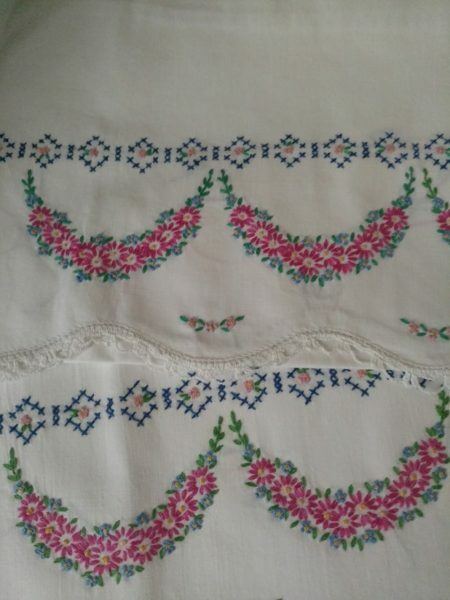 Here is a fabulous 1950’s pair of vintage pillowcases in unused condition. I am offering these cases from a home of two unmarried sisters who spent much leisure time in the art of tatting and crocheting. Didn’t matter if they used or gave them away, they loved the joy of making beautiful needle work pillowcases. So the drawers and closets were full of unused pieces! I can also attest, their work is beautifully done.